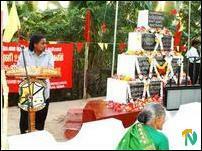 The renovated mausoleum of the LTTE cadres was declared open Tuesday evening. The mausoleum was first constructed in 1990 and later the Sri Lanka Army destroyed it in 1996 military operation. Major Murali was holding the post of Thamileelam Student federation at that time of incident. Other LTTE cadres died in the battle were Captain Gandhi, Nirakaran, Lt.Tharshini, Nirmala, Nithi, Panchan, Mihinda, Sutha and Amuthan. Major Murali's mother Ms Velupillai Lakshimiammal garlanded the photograph of his son. Parents of other LTTE cadres also garlanded other photographs, sources said. Jaffna district LTTE deputy political head Mr.Semmanan lit the flame of sacrifice. Jaffna district women political wing leader Ms Thamilini hoisted the Thamileelam national flag. Kopay Christian College Principal Mr.P.Sivakadachcham, Ms Thamilini, Jaffna district students Forum President Mr.K.Kuhendran and several others also spoke. Mr.Kanagalingam further said Tamils of NorthEast are not against the Indian government, Indian people and their interests.